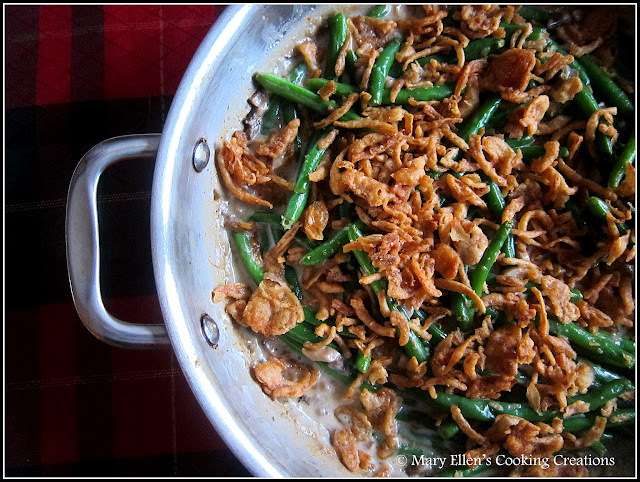 Confession: I never had the wildly popular cream-of-something-soup based green bean casserole traditionally made at Thanksgiving, and I never thought I was missing anything with all of the other amazing food on the table. But now after having a homemade version, I never want another Thanksgiving dinner without this dish. Making the creamy sauce is SO easy that there is NO need for the canned soup. And even though I never had the canned version, I can guarantee that there is no comparison - this one will blow you away. Heck, the sauce was so good that I couldn't stop tasting it as I was making it. I considered forgetting the beans once the sauce was done and just eating it as a soup. I did take one shortcut just because I had so much cooking going on that day. I used the canned fried onions instead of following the recipe to make my own. The next time I make this I will make my own, but if you need a shortcut this would be the one I recommend. So if you are still trying to finalize your turkey day menu, try this one. I can't wait until next week so I can make it again!! 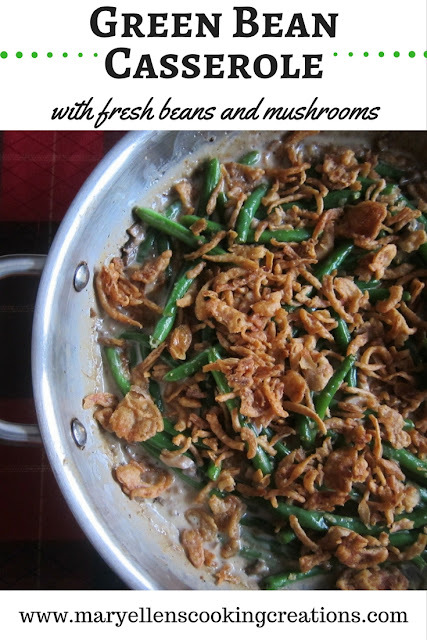 Prepare the beans: Bring a large pot of salted water to boil and boil greens for 5 minutes. Drain beans, then plunge them into ice water to full stop them from cooking. Drain again, and set aside. You can do this ahead of time, up to one day. Make the mushroom sauce: Over medium-high heat, melt butter in the bottom of a 12-inch cast iron skillet. Add the mushrooms, salt and pepper and saute them until they start releasing their liquid, anywhere from 3 to 5 minutes, depending on how they were chopped. Add the garlic and saute one minute more. Add the flour and stir it until it fully coats the mushrooms. Add the broth, 1/4 cup at a time, stirring the whole time. Simmer mixture for 1 minute, then add cream and bring back to a simmer, cooking until the sauce thickens a bit, about 5 to 6 minutes, stirring frequently. 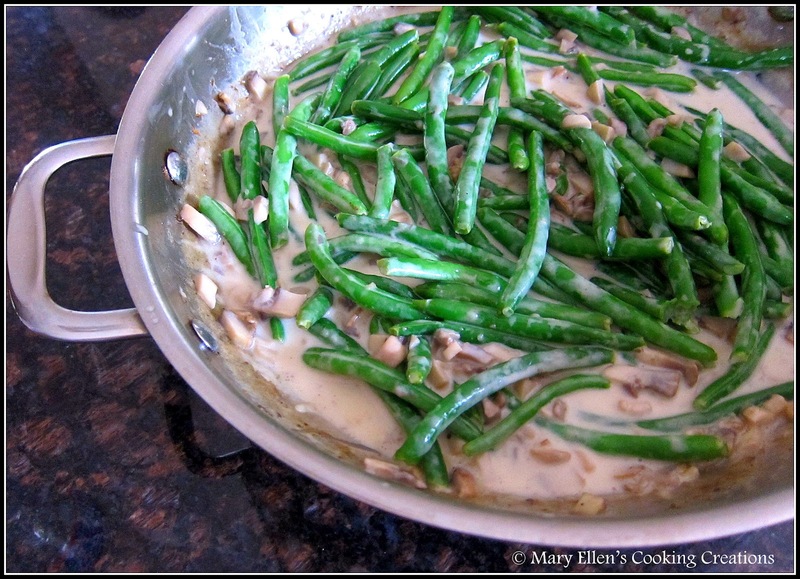 Assemble and bake: Add cooked greens beans to sauce and stir until they are coated. Sprinkle crispy onions over the top. Bake for 15 minutes, or until sauce is bubbling and onions are a shade darker. Eat at once.